We all know that a hot bowl of oatmeal is a healthy and delicious start to your day, but it goes beyond that. Oats have amazing skin benefits that you should be taking advantage of right now. Dr. Debra Jaliman, dermatologist and author of Skin Rules, says to combine 1 tsp of ground oatmeal, 1 tsp of lemon juice, and 2 tsp of yogurt and apply to the face. This scrub tones and hydrates the skin. “Oatmeal is great at removing excess oil and dirt from the body and face, thanks to the saponins it contains,” says Dr. Roshini Raj, co-founder of Tula. Their cleansing and exfoliating properties make oatmeal a powerful ingredient in many face scrubs, cleansers and shampoos. You can also use ground oats to eliminate excess oil from your scalp, which will give you an extra day or two between washings. 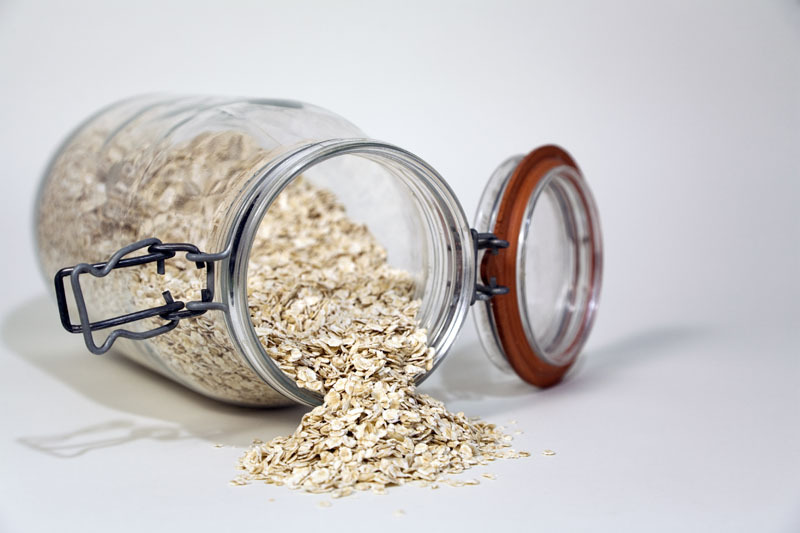 Plus, oatmeal has strong anti-inflammatory properties and can be used to relieve itchy, uncomfortable skin. If you have a sink drain that can handle the roughage, you can make an awesome hand scrub with oatmeal, honey and a dash of olive oil. You can add in your favorite essential oils to make it more fragrant, or just leave as is. It’s great for sensitive skin because it exfoliates gently. Oatmeal, best known for it’s anti-inflammatory and antioxidant benefits, is especially good for sensitive skin. It can be used in the bath for skin softening and very gentle exfoliation. “Next time your skin is feeling rough from the harsh winds of winter, add a 1/2 cup of oatmeal to your bath with some lavender essential oil. Your skin will feel softer and the aromatherapy effects of the lavender will help you relax and rejuvenate,” says Denise Weaver, owner of Smart by Nature. Dr. Marina Paredo says oatmeal works great as a dry shampoo for blondes as the oats will absorb oil. Just rub some ground oats over your scalp and brush out excess oats with a boar bristle brush. Natural dry shampoo! Oatmeal helps with hydration because it is rich in lipids. It locks in moisture and its proteins protect the skin’s barrier function. “Oatmeal mixed with cool water can be beneficial for sunburn, windburn, redness, chicken pox, eczema and itchiness. Bathing in colloidal oatmeal(finely ground) can really sooth irritated skin,” says Dr. Gary Goldfaden. Oatmeal helps with acne because it contains ‘saponins’, which remove dirt from pores and are anti-inflammatory and anti-oxidants. Oatmeal is also very moisturizing due to the high level of fat found in it.